You know that feeling you sometimes get when you step off an aeroplane in a Mediterranean country and the warm air envelops you like a deep sigh? Your whole body relaxes and that’s the moment when you realise that you’re in a foreign country, and now properly away from home. That’s how it feels to open the pages of Like Bees to Honey and start reading. The book opens in Manchester airport as Nina and her son board a plane to Malta. Nina is attempting to see her parents and make peace with them. After having been disowned by them for falling pregnant with Christopher while at university in England, she was not allowed into their house the last time she was on the island. Now, this isn’t the holiday island you or I will ever visit. Or, at least, I don’t think it is! The Malta of Like Bees to Honey is a transit lounge for recently deceased spirits and somehow Nina’s son, Christopher, enables her to see them, speak with them and help them. And, in return, they help Nina come to terms with her own loss. One so great that she has yet to admit it to herself. Being surrounded by dead people, spirits in transition and ghosts may sound creepy and disturbing, potentially the stuff of my nightmares, but they’re written so well as to be a non-threatening and even comforting presence throughout the book. I accepted them as readily as the living characters in the book. Perhaps because some of them have more of a life than the living and, therefore, seem just as “alive” and real. One of my personal favourites is a two-pint beer-swigging Jesus, who wears red nail polish on his toes and accepts presents of Cadbury’s chocolate. Now that’s my kind of son of God. Like Bees to Honey is a wonderfully poignant and beautifully written story about loss and redemption and families and belonging. Nina was forced to leave her family, its culture, customs and country behind, when she started her own family in her adoptive country of England. As Like Bees to Honey traces the return to her home island of Malta, it introduced me to a country that I didn’t know at all. One of the things I love about travelling, whether in reality or through the medium of a book, is being able to get a sense of place. Each chapter begins with an excerpt from a travel guide, so I immediately learnt something interesting about Malta, the setting for the majority of the book. The cooking rituals and featured recipes further helped me get to know Malta through its food. Even if I go somewhere for a short space of time, I try and learn a couple of simple phrases. Caroline incorporates Maltese words and phrases into the book and, each time she uses them, she cleverly includes their translation underneath. This reinforces their meaning far more effectively than any glossary at the back of the book ever would have done and, by not having to flip back and forth in the book, there is no interruption to the story’s flow. I felt as if I were learning Maltese alongside Nina who is re-learning what has almost become a foreign language to her. Caroline recently posted some photos of sights and places on Malta which inspired the book on Facebook. It was strange browsing through them because they felt more like illustrations than actual photos. It was just how I imagined the island to be from having read Like Bees to Honey. Proof if any were needed that a talented and skilled author, such as Caroline Smailes, can paint all the word pictures you need in order to conjure up the world of a book. I know this will sound strange after lauding Caroline’s ability to create but another aspect of the book that I enjoyed and appreciated were the empty spaces. What I mean is that the book formats gaps (or breathing spaces, as I liked to see them) between words and paragraphs. Together with different fonts, page edging and letters written but never sent, these all work together to help build the pace and atmosphere of the book. I shifted up or down reading gear, accordingly, to take in who was talking, what was happening, or simply to enjoy a description of a taste, smell or sound, like that of flip-flops on cobbles. If the beautiful cover alone doesn’t convince you, then the blurb on the back cover promises that “Like Bees to Honey … is a magical tale that will live with you long after you finish reading.” It is, and does. And the beauty of such a book is that you only ever have to reach for it and open it to find yourself right back in amongst the magic all over again. I hope you find your way there very soon because it’s a wonderful place to spend some time. Like Bees to Honey is published by The Friday Project, an Imprint of Harper Collins, and is available from all good bookstores and online retailers. 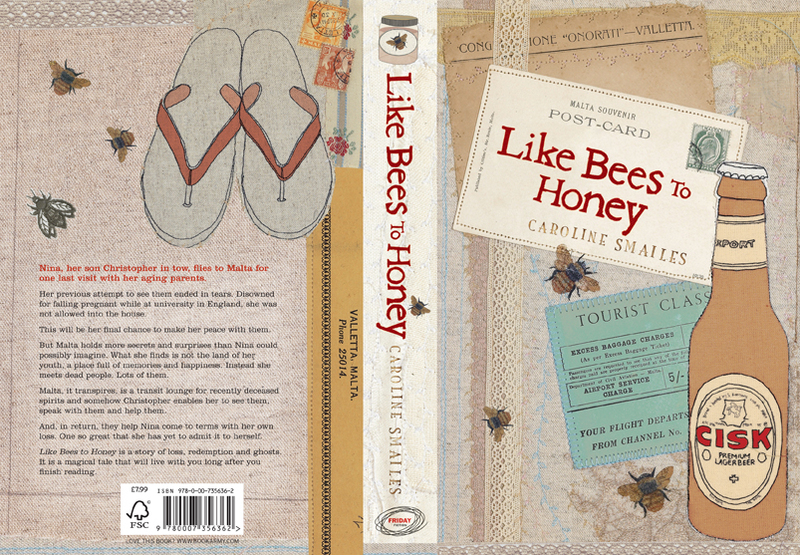 To find out more about Caroline Smailes and all her books, including Like Bees to Honey, check out her Author Website, which has a regularly updated blog, her Author Facebook Page or follow @Caroline_S on Twitter. A beautiful review, Thank you so much for sharing it. It is a fab, fab book. I am too scared to write a review as I am scared that I would not do it justice. Thank you. It is a fab book… and you have no idea how long it took me to write this because I felt exactly the same way as you about reviewing it! Great review, Kath. I felt the same way — it’s a magical book. Loved your review. You’re so right about the spaces and different fonts, I thought they worked so well. I thoroughly enjoyed this book too. I thought I had already left a comment on this post but obviously not. Der… I adored every word of this novel and wrote a long review of it myself. That’s not something I do often (or else I’d do nothing but write reviews), but Like Bees to Honey is something special.